"We are in need of nice B3 Hammonds and leslies for our inventory. Please contact us for a sale!" "WORLD CLASS Hammond Organs and Leslie Speakers"
WELCOME a wonderful selection of "living room" vintage Hammonds on the worldwide internet. A BIG THANK YOU to all our clients throughout the world for our success. We take great pride in our restoration, servicing and extreme detailing of every lovely organ. Only at B3Hammond.com will you view full sets of professional photos of each Hammond. We are known as the Hammond "Super" store that has the pristine quality organs with honest descriptions. Click on the "FOR SALE" key and enjoy the journey! All of our Hammond Organs and leslie speakers are professional restored and detailed. All have the original factory finish. Please review the intense servicing and restoration procedure on the "For Sale" page. 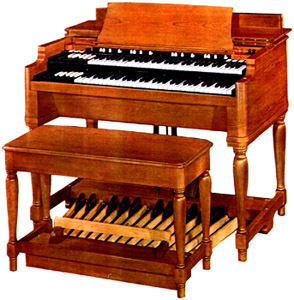 We will arrange to have your Hammond organ delivered to any location. Stateside delivery by our personal delivery team to INSIDE and SET UP in your living room, church or studio averages $1,000.00. Stateside shipping requires no crating. Overseas shipping via crated airfreight or by ocean. Shipping and crating costs are the responsibility of the purchaser. Please note, We can install a complete voltage convsersion kit for correct operation of the Hammond and Leslie with your countries power requirements. The kit consists of a Frequency conversion kit and 50 cycle leslie motor pulleys installed plus a step down transformer. Please contact us for pricing. We're always interested in buying Tonewheel Hammonds: B-3,C-3,A-100 series, and Leslie speakers. The "contact us" section of our site has all the information you'll need.